Two pods in one week! 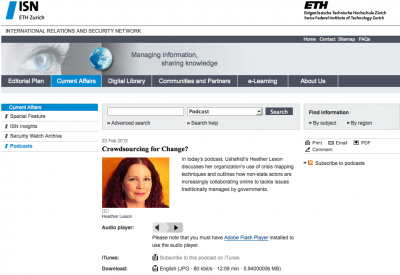 Valerie Sticher of ISN: International Relations and Security Network interviewed me for the ISN podcast on “Crowdsourcing for Change“. And, I’ll host a Podcamp Toronto 2012 session on Sunday, February 26, 2012 focused on “Dispatches of Disruption“. In this 12 minute chat, we discuss Crisismapping, CrisisMappers Network, Ushahidi, Security and Hackathons (specifically Random Hacks of Kindness). I highly recommend that you follow the full podcast. Sunday morning early sessions at Podcamp Toronto are sometimes quiet. Here’s to having a good discussion about Digital Activism and the power of the Internet. Every day someone uses the power of the Internet to change their world. What does it mean to be a disrupter? an innovator? a volunteer? What lessons can you activate at home? at work? I’ll share some examples of disruption aimed at corruption, elections, violence, potholes, agriculture, burgers, #futurewewant, and emergency response. Digital activism from volunteering to hacking to mapping is changing institutions and governments. We are just a mouse click away from change. Or, are we? Hope you can join this chat. If you are only attending on Saturday, look for me at the registration desk.